October 22-28, 2017 is Pro Bono Week, and lawyers across Colorado and the nation are donating their time and energy to promote access to justice. To honor Pro Bono Week, I participated in a Colorado Legal Services virtual legal aid clinic. This program uses technology to allow lawyers throughout the state to serve some very rural and remote parts of Colorado. Colorado Legal Services runs a virtual clinic to serve the San Luis Valley, one of the more remote areas in Colorado. The San Luis Valley is made up of six counties: Alamosa, Conejos, Costilla, Mineral, Rio Grande, and Saguache (directly south of my own county, Gunnison). Mineral County is the second least populous county in Colorado. (Hinsdale County, also directly south of Gunnison, is the third least populous county in Colorado. I live in a small town, but it is a resort community so has many resources that similarly sized towns lack. I am surrounded by some truly wild and remote places!) Saguache County has a density of less than 2 people per square mile (compare this to Boulder County, which has a density of about 4,300 people per square mile). I saw a flyer for a virtual legal aid clinic, and I was immediately intrigued. Being a country lawyer, I love serving rural communities. I contacted Jen Cuesta, a Colorado Legal Services attorney, filled out the volunteer attorney application (which included providing my malpractice insurance information and information for a background check), and Jen was immediately in touch with me. Once we picked the date of the clinic I would participate in, we scheduled a Zoom teleconference training. In the training, Jen walked me through the Zoom features that we would use, explained the process of the virtual aid clinic, and answered my questions. The entire training took maybe 20 minutes. Jen also sent me a very (very!) helpful and through attorney handbook that she put together, which summarized issues, standards, and process in family law, landlord-tenant, consumer collection, small claims, and probate. Public libraries in the San Luis Valley host the clinic. Clients come to the library and use the library’s computer, internet, and facilities in a confidential setting. Clients are prescreened for income eligibility and legal issues. The attorney uses Zoom to teleconference with the client at the library. The attorney can do this from their home or office anywhere in the state. By using the share screen function on the Zoom program, the attorney can pull up the Colorado Court website and walk the client through the various self-help forms, such as family, small claims, protection orders, housing, and estate cases. After the client interview, the attorney uses a Google Docs link to submit a closing letter. The attorney fills out the form with the client’s name, their own name, the client’s legal issues, the advice given, and referrals given. The Legal Services attorney follows up and provides the client with the names and contact information of the referral and JDF forms. I was so impressed by how smoothly the clinic ran and how effective it can be to use technology like Zoom and Google Docs to connect attorney and client. I am planning on volunteering for a virtual clinic again. So many areas of Colorado suffer from a lack of access to justice, and the urban-rural divide in Colorado is still significant when it comes to legal resources. This type of innovative clinic can offer so much to underserved communities, and I hope that the legislature continues to invest in legal aid. Chief Justice Nancy E. Rice of the Colorado Supreme Court has proclaimed October 22-28, 2017 to be "Pro Bono Week." 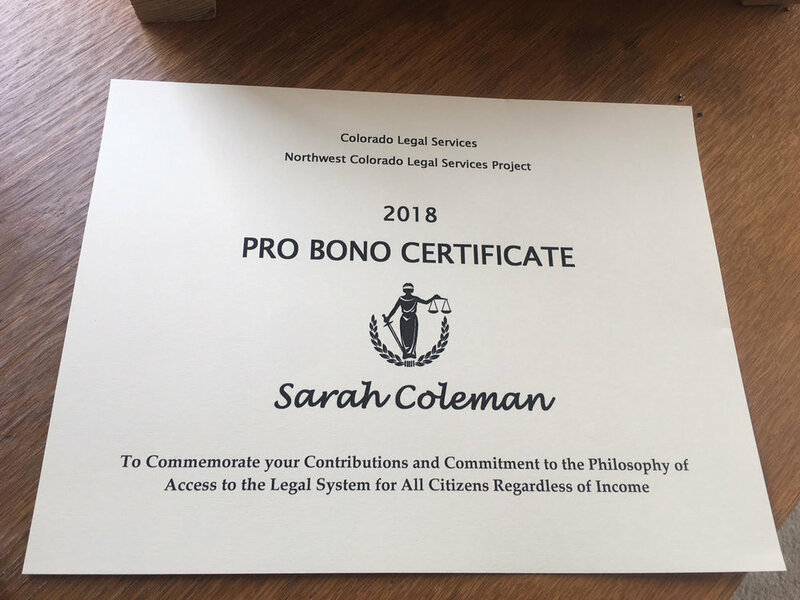 Coleman Law is proud to support Pro Bono Week by participating in a Colorado Legal Services clinic.